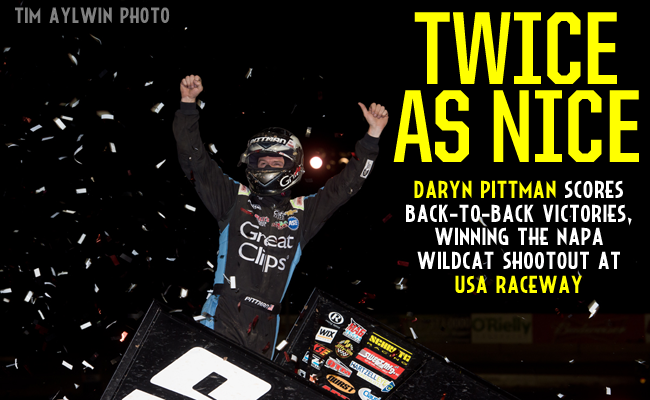 TUCSON, Ariz. - April 18, 2016 - Daryn Pittman pulled out to an early lead then held off challenges from both Joey Saldana and Donny Schatz to capture the NAPA Wildcat Shootout at USA Raceway, his second World of Outlaws Craftsman Sprint Car Series win in-a-row, and third this season. Pittman's win continues Kasey Kahne Racing with Mike Curb's hot-streak to three wins in-a-row after he captured the victory at Perris Auto Speedway on Saturday and teammate Brad Sweet won at Bakersfield Speedway on Friday. "It was just a great win," Pittman said. "I am a lot happier about the win tonight than I was at Perris, I felt pretty bad there about getting together with Paul [McMahan]. "These guys have worked hard this whole west coast swing, we have had really good cars. I am really happy with how our car performed as I feel this is one of my weak spots on the tour, and it just shows that hopefully we can be this strong all year." Pittman, piloting the No. 9 Great Clips/Sage Fruit car, showed his speed early in the night, capturing the quick-time award and dominating his heat race to gain access to the 6-lap dash. The Owasso, Okla. native held off a challenge from Saldana in the dash to claim the win and the first-place starting position for the 30-lap feature. Saldana, in the Roth Enterprises/HR Livestock settled for second, and started to Pittman's outside. Once the feature kicked-off, it appeared as if Pittman's control over the top spot could come under fire early. Saldana stayed glued to the leader's bumper as well as fourth-place starter Shane Stewart, who drove around Jason Johnson on the opening lap for the third position. The top four remained consistent for much of the feature, but a hard-charging Donny Schatz, in his Bad Boy/Chevrolet Performance No. 15, quietly made his presence known, as he worked around Johnson for the fourth position just past halfway. Schatz, who started the feature in the fifth position, closed the gap and passed Stewart after the third-place driver encountered issues working around a lapped car. Schatz then set his sights on Saldana for the second position. With just a few laps remaining, the top three were only separated by less than a second. The seven-time World of Outlaws champion Schatz, made his move on second place Saldana but did not have enough laps to catch up to the leader. "It was a respectable finish," Schatz said. "We had a legitimate shot at winning the race if everything would've went the right way. "It's just the way it is. We have still managed to come forward every time we have had these situations and that's what it takes to win a championship - you just keep digging and clawing and motor through there. The first feature in the state of Arizona since early March went caution free, as Pittman pulled out front early and led flag-to-flag to capture the victory. He joined Schatz as only other driver to win back-to-back races. Pittman's third win of the season comes on crew chief Kale Kahne's birthday. "It was just a flawless night for our whole team," Pittman said. "We started out unloading fast - quickest in hot laps, time trials, won our heat, dash and the A-Main, so it couldn't of gone any better. "Our car was really good and it was Kale's [Kahne] birthday today, so we got a win for him which is pretty special too." Schatz battled his way to a second place finish, bettering his two fifth-place finishes from last weekend's action at Bakersfield and Perris. "We did the best we could tonight with a second, but I think we had a little bit faster car there at the end with the way the race track changed," Schatz said. "That's the way it goes - you win some and you lose some. We just have to keep digging and that's what these guys do, they are already preparing for the next race." Saldana brought his car home third, continuing his week-long streak on top three finishes that includes a third at Perris and second at Bakersfield. "These last three races - a third, third and second - have been better than the week before where we had a blown tire, a 10th and a 12th," Saldana said. "It's a new team, new crew and we just had a hiccup there for three races but we definitely learned a lot with our race car and are getting better. "It's just a shame because we capitalized on the dash and got us a front row start, but we just couldn't get our motor to take off very well. Every time we needed to, I could run Daryn [Pittman] back down. I felt like I had a better car than him but I just used my tires and my car up to get him and I just couldn't get it done. Definitely a good solid run for us, just need to be patient and not wear my car out before the end of the race." The World of Outlaws Craftsman® Sprint Car Series invades the Lone Star State for the Texas Outlaw Nationals double-header at Devil's Bowl Speedway in Mesquite, Texas on Friday, April 22 and Saturday April 23. Great seats are still available, and can be purchased at 844-DIRT-TIX or by visiting WorldofOutlaws.com/DevilsBowl. RACE NOTES: Daryn Pittman ties teammate Brad Sweet and Joey Saldana with a series-leading three quick-time awards this season...Logan Schuchart becomes the ninth different driver to win the KSE Hard Charger Award after he gained five spots in the feature...Daryn Pittman scored his series leading sixth feature pole-position start of the season, which is four more than any other driver. CONTINGENCY WINNERS - MSD Ignitions ($25 cash): Randy Waitman; MSD Ignitions ($50 cash): Daryn Pittman; Penske Shocks ($50 cash): Donny Schatz; JE Pistons ($50 cash): Paul McMahan; VP Racing Fuels ($50 cash): Paul McMahan; Edelbrock ($50 cash): Terry McCarl; Comp Cams ($50 cash): Jason Sides ; Morton Buildings ($50 cash): Jason Sides; Cometic Gasket ($50 cash): Jason Sides; Super Flow ($50 cash): Greg Wilson; KSE Racing Products ($100 product certificate): Logan Schuchart; Comp Cams ($50 product certificate): Daryn Pittman; JE Pistons (Set of Rings): Randy Waitman; JE Pistons (Set of Rings): N/A. SEASON WINNERS: Donny Schatz - 5 (Volusia Speedway Park on Feb. 14, The Dirt Track at Las Vegas on March 4, Stockton Dirt Track on March 18, Stockton Dirt Track on March 19, Silver Dollar Speedway on April 2); Brad Sweet - 5 (Volusia Speedway Park on Feb. 13, Volusia Speedway Park on Feb. 14, Cotton Bowl Speedway on Feb. 26, Ocean Speedway on April 1, Bakersfield Speedway on April 15); Daryn Pittman - 3 (Royal Purple Raceway on Feb. 27, Perris Auto Speedway on April 16, USA Raceway on April 18); David Gravel - 1 (Thunderbowl Raceway on March 12); Jason Johnson - 1 (Placerville Speedway on March 24); Joey Saldana - 1 (The Dirt Track at Las Vegas on March 3); Shane Stewart - 1 (Arizona Speedway on March 6). World of Outlaws Craftsman® Sprint Car Series Statistical Report; USA Raceway; Tucson, Ariz.; April 18, 2016.